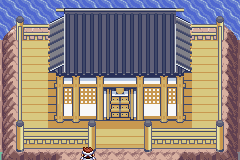 In the Battle Arena, the trainer has a standard three-versus-three battle; however, if he doesn't knock out the opponent's Pokémon in three turns, he is judged on mind (use of offensive moves), skill (effectiveness of moves) and body (ratio of HP at the beginning and end of battle) to decide the outcome. A circle is worth two points, a triangle is worth one point, and a letter X is worth zero points. The Pokémon with less points faints immediately. In the event of a tie, both Pokémon faint. During the battle, the trainer cannot switch between Pokémon. After 27 and 56 consecutive wins in the Arena, the trainer can fight Arena Tycoon Greta. The first time the trainer defeats her, he is given the prize of the Silver Guts Symbol. Later on, the trainer get the Gold Guts Symbol. Greta's name is from guts, which the Battle Arena tests.